Video portraits that honour the 2015 Governor General’s Awards in Visual and Media Arts Awards (GGAVMA) are unveiled. Budget 2014: Economic Action Plan 2014 proposes to provide ongoing funding of $105 million per year in support of core arts programs for 2015-2016. 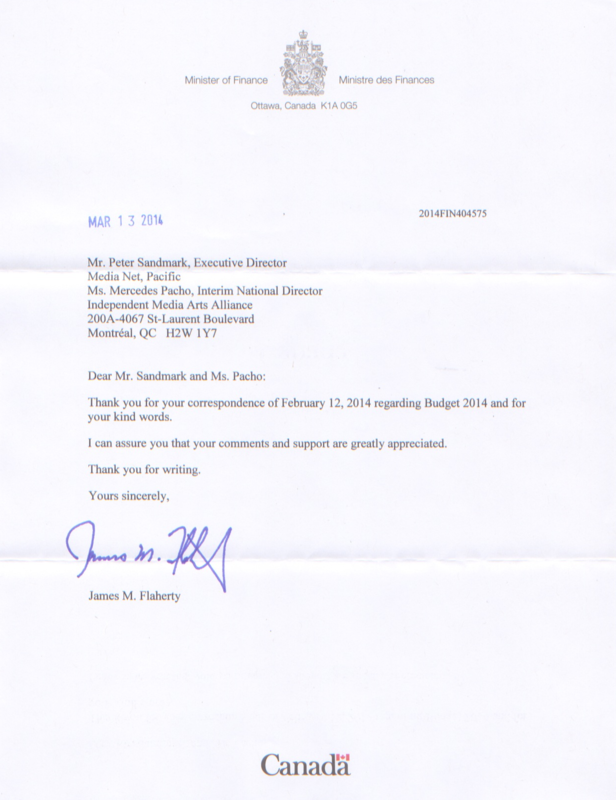 Letter addressed to The Honourable Jim Flaherty, Minister of Finance. Canadian Radio-Television and Telecommunications Commission (CRTC) Initiative: towards a national discussion about the future of Canada’s television system. The Canada Council and the Independent Media Arts Alliance (IMAA) are once again coming together to honour the recipients of the Governor General’s Awards in Visual and Media Arts. 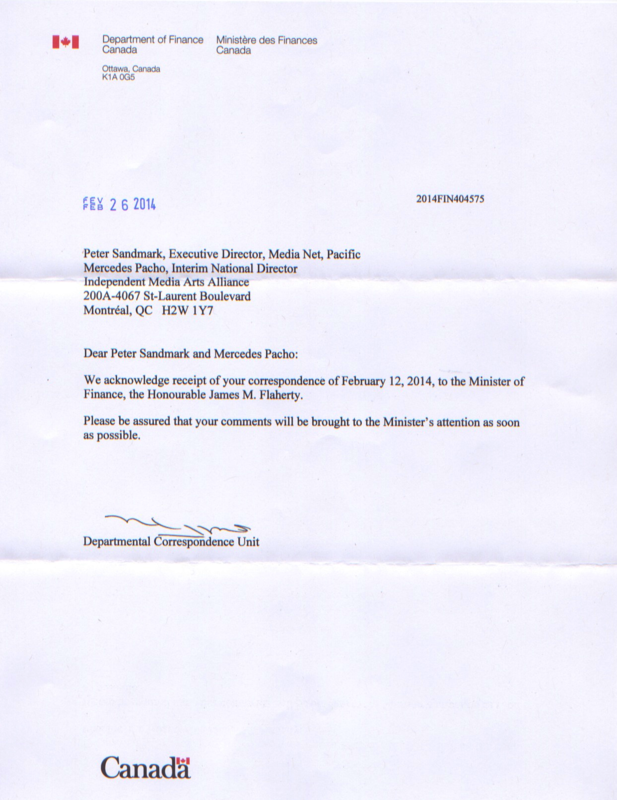 The Independent Media Arts Alliance (IMAA) urges the Canadian Government and the Egyptian Embassy to Canada to increase efforts to secure the immediate safety and release of Dr. Tarek Loubani and Professor John Greyson. The Canadian Arts Coalition’s signature event, Arts Day on Parliament Hill, is scheduled for Tuesday, October 22, 2013 – and we are now actively recruiting artists, arts supporters, and arts managers from across the country to take part in a briefing session on the evening of October 21, and a day of meetings with MPs and senior officials in Ottawa on October 22. We’re looking for people who can speak convincingly about the value that the arts bring to Canadian communities and the impact of federal arts investment, from all artistic disciplines, linguistic groups, regions and cultures. For the second year, the IMAA is organizing a “date your MP” campaign in a proactive effort to raise awareness about the media arts and to present recommendations that are shared by the sector as a whole. Between May 13th and May 20th Members of Parliament will be in their home ridings and many of them will be available to meet with their constituents. Please find here an advocacy toolkit that will help you frame the discussion. It includes a proposed script, a leave-behind document with IMAA’s key recommendations and a page of recent articles and studies that support our recommendations. We suggest that you go in a team of two. It helps create a lively discussion and generates a stronger message. The IMAA will hold a members meeting the day following Arts Day on October 23 which will be a full day of discussions about the key issues and challenges facing the media arts sector. This will also be an important occasion for members to direct the IMAA board and staff on central advocacy objectives. The meeting will happen shortly after the Canada Council’s multi-year deadline, and will be a valuable opportunity to engage in a dialogue with the Media Arts Section staff about the Council’s directions as outlined by the change agenda. Senior management from the Film & Video Policy and Programs at Canadian Heritage will also attend as observers. The goal will be to bring the media arts community together to collectively shape our own future. Regarding the new Budget Bill C-60 that contains an amendment to the Financial Administration Act giving Prime Minister Stephen Harper and his Cabinet the power to dictate collective bargaining, terms for salaries, benefits and working conditions for several crown corporations. IMAA’s National Director, Jennifer Dorner had a meeting, April 29th 2013, with the new Liberal Leader Justin Trudeau and Daniel K Seligman from Pop Montreal (in Trudeau’s riding) to discuss the vital role that the arts have in our diverse culture. This is especially important at a time when there is a need to rebuild Canada’s cultural identity and values in response to significant changes unfolding in the world around (demographic, technological, economic, generational, political). Canada celebrates its 150th anniversary in 2017, perfect occasion to invest in the arts, to showcase where we have been as a nation, where we would like to go, and what we should project to other nations. Justin Trudeau is 100% in support of “doubling” the Canada Council’s funding. Jennifer presented the new liberal leader with several reports and studies outlining the important economic and social impact that the arts have in Canada in hopes that they build a solid arts platform. He is very willing to work with the arts sector to ensure that he “gets it right”. The Independent Media Arts Alliance (IMAA) is launching a crowdfunding campaign today to finance an inaugural National Media Arts Prize. The first of its kind in Canada, the IMAA will be gathering funds on Indiegogo to establish the award. We have a powerful video illustrating the importance of this cause which is also visible on our Indiegogo Campaign page. View video portraits of the award winners, commissioned in partnership with the Independent Media Arts Alliance. Recommendations submitted to the Canada Council for the Arts, Media Arts section, regarding the review of the Operating grant for production centres programs.